The first Laguiole knives were inspired by the Arabo-Hispanic knife, the Navaja. Cattle herders and shephards from southern France who migrated to Spain in the winter brought them back as souvenirs. Local cutlers and blacksmiths blended the Navaja with a popular local knife, the “Capuchadou” creating what is known as the Laguiole Knife. In 1829, Jean-Pierre Calmels, a blacksmith from the village of Laguiole, designed the first Laguiole knife. A few years later he added an Awl or Trocar to the knife in response to the need of local shepherds to treat their livestock. The awl was used as a surgical tool to pierce the stomach of cattle to relieve them from bloat; This addition has very little use in modern society. In 1880, the corkscrew was incorporated into the Laguiole knife in response to the increase on the consumption of bottled wine in the big cities and the demand from bar and restaurant owners from Paris. As demand increased, cutlers from the Laguiole region asked Thiers, known as the capital of knife making in France since the 11th century, for help to be able to meet the demand. For over 50 years, production stopped in the region of Laguiole but it continued in the town of Thiers. As production grew in the Thiers region, so did the use of machines in the making of the Laguiole knife. At the beginning of the 1980’s a handful of knife makers from the region of Laguiole decided to bring back the tradition and the art of knife-making which made the area of Laguiole so popular a hundred and fifty years before. 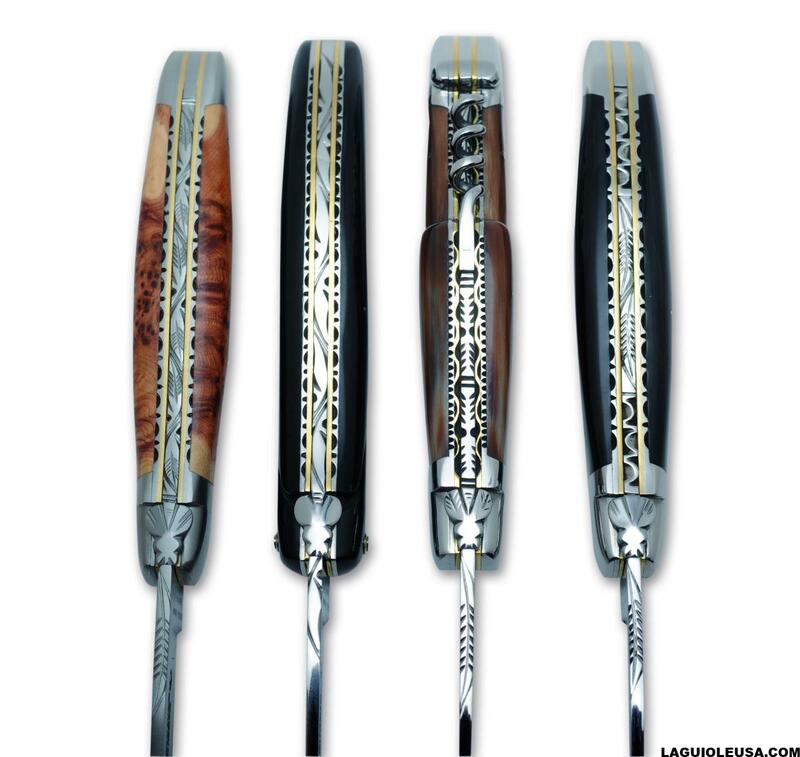 Today, the popularity of the Laguiole knife has extended to most parts of the world. One can find Laguiole knives made in Asia (China), the middle east (Pakistan) and all over France. Most Laguiole knives and corkscrews made in France are industrially/machine made with low quality steel and poor quality handle materials; However there is still a few companies, especially in the Laguiole area, that continue the Laguiole tradition by making the knives entirely by hand and using high quality steel and top quality woods, horns and other materials from around the world.